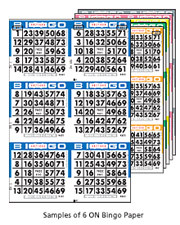 Bingo cards are printed in a variety of card configurations on a sheet to give the hall operator and players plenty of options. 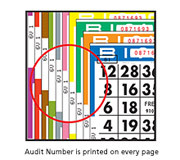 Choose from a single cut (1S1) up to a full 36 ON (36S6) sheet (36 cards). Combine different cuts and colors with the different series (1-63,000) to add variety and excitement to your bingo sessions. All bingo paper is cut from a master sheet. Following are examples of master sheet sizes. A 24 ON layout has 24 bingo faces on a sheet, a 30 ON layout has 30 faces on a sheet and a 36 ON layout has 36 faces on a sheet. Certain cuts come naturally from certain master sheets; other cuts (as in a 15H5 taken from a 36 ON layout) require an off cut – which can be packed together, packed separately or discarded. *In each cut description, the 1st numeric character(s) denotes the total number of faces on the cut; the 2nd alpha character denotes the overall appearance of the cut: vertical, horizontal or square (V, H or S) and the last numeric character denotes the number of faces “across” or horizontally on the cut.